We continue our look at the hats at today’s wedding of Princess Eugenie and Jack Brooksbank with those worn by members of the Phillips family. Princess Anne repeated her emerald green straw blocked beret base hat trimmed with wide bow in the same fabric as her suit. While the hat base isn’t as refined as it could be, the colour is absolutely stellar on Anne. Autumn Phillips topped her emerald floral dress with a straw button percher hat trimmed with large straw bow, curling green quills, green open weave net veil and small, trimmed feathers in black, pink and green. Zara Tindall wore a grey silk covered button percher trimmed with a lavish spray of silver roses, grey feathers and leaves. The hat is a go-to shape and style for Zara- it works beautifully on her and made a great compliment to her bright blue coat. There are extremely limited photos available of the Armstrong-Jones family- most visible is the wide cartwheel brimmed picture hat in pale pink felt worn by Lady Sarah Chatto. Sarah favours classic shapes such as this and while she often leans to neutral colours, this pink is so lovely on her. The Countess of Snowdon topped her bohemian printed dress with a delicate gold headpiece. It’s an unexpected pairing of dress and headpiece and I wish we had a better view. Lady Margarita Armstrong-Jones wore a in a navy button percher with veil printed with large dots. It’s a youthful hat that suits her well- the pompoms on the veil are charming! What do you think of these six hats today at Princess Eugenie’s wedding? While Princess Eugenie’s fashion was very 1950s today, Viscountess Linley jumped forward to the swinging 60s with her ensemble. Her hat is an eye catching rounded pillbox in textured cornflower blue straw, trimmed with a flat bow at the front. With her plaid coat from the same era, it’s a LOT of look but Serena carries off the exaggerated hat and I think it’s rather fun on her. Margarita Armstrong-Jones looked very grown up in a green silk covered percher cocktail hat trimmed with looped green bows and white silk flowers. This shade of green is lovely on Margarita and the scale is perfect for her. We have another budding royal hat wearer here, dear readers! 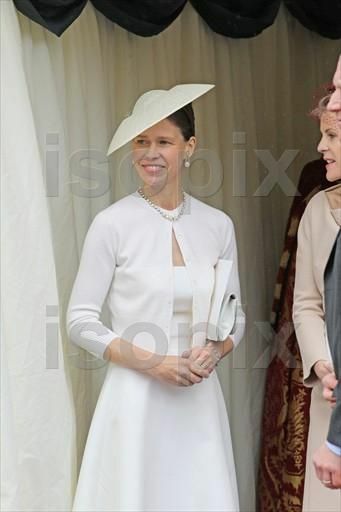 Lady Sarah Chatto topped her navy and white ensemble with a new saucer hat in the same colours. The white straw underbrim on this piece livens it up and while I’d love to see Sarah try out a few other shapes, I really like the colour contrast and sale of this piece on her. It looks like a hat most of us could integrate into our own wardrobes and this practicality makes me adore Sarah’s millinery choices all the more. Another three new hats for the British royals today! What do you think of these three very different designs?